Red Giant’s Primatte Keyer just saw its 5.1 update, which adds support for both Windows and Mac versions of Adobe Premiere Pro, Adobe After Effects, Apple Final Cut Pro X, and Motion. Primatte Keyer has seen much use in the film and broadcast realms, making it an “industry favorite for chroma keying and compositing”. Now such features as quick and easy chroma-keying, uneven lighting correction and other useful compositing tools are all at the fingertips of editiors using Premiere Pro and more. Primatte Keyer 5.1 is available as a free upgrade those who own version 5, with a $99 upgrade for any older versions. Newcomers can purchase the tool for $499. For more information, take a look at Red Giant’s press release below, and be sure to visit www.RedgGiant.com. Portland, Oregon – August 12, 2014 – Red Giant, makers of essential software tools for filmmakers, editors, VFX artists and motion designers, today released Primatte Keyer 5.1, an update that adds support for Adobe Premiere Pro, Apple Final Cut Pro X (FCP X) and Motion. Using the same keying technology from blockbuster hits such as “Lord of the Rings,” “Harry Potter” and “Spider-Man,” Primatte Keyer lets users easily remove a blue- or green-screen background, often with the touch of a button. Primatte Keyer 5.1 takes the powerful chroma keying tools that have, up until now, only been available to Adobe After Effects users and puts them into the hands of editors. Primatte Keyer now supports After Effects, Premiere Pro, FCP X and Motion, giving all users of these host apps direct access to high-end tools for fast automatic keying, digital green screen relighting, and indispensable compositing and cleanup tools. Fast, Automatic Chroma-Keying: Remove the green/blue-screen with the touch of a single button. The Best User Experience with the Best Results: Primatte Keyer’s user interface makes it easy to select the background and foreground, and to separate them out for a great key. Primatte Keyer’s Cleanup tools help make composites look solid without much additional effort. Correct Uneven Lighting: Primatte Keyer can analyze the background and even out the lighting before performing the key – making for a much cleaner background removal. Powerful Compositing Tools: Primatte Keyer includes tools essential for turning your chroma key into a realistic composite – including Light Wraps, Color Matching and much more. 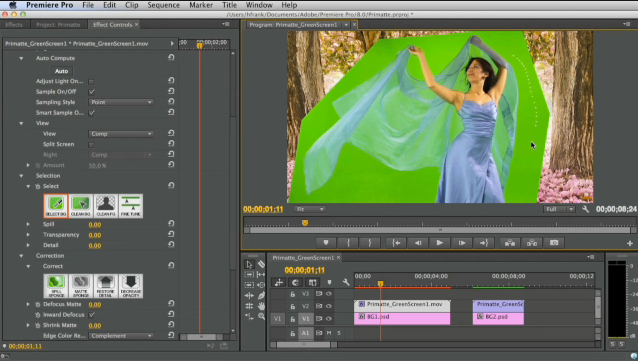 Red Giant Primatte Keyer 5.1 is a free upgrade for existing version 5 users. Users of older versions can upgrade to version 5.1 for 99 USD and new users can purchase the software for 499 USD. Learn more and purchase Primatte Keyer 5.1 here: http://www.redgiant.com/products/all/primatte-keyer/. Members of the media are invited to review Primatte Keyer 5.1. Please email Anya Oskolkova at anya@zazilmediagroup.com to request a license. Red Giant is a software company made up of talented artists and technologists who collaborate to create unique tools for filmmakers, editors, VFX artists and motion designers. Our company culture is focused on finding balance between work and life – we call it “the double bottom line” – this philosophy helps us ignore complexity in favor of building simple tools that yield giant results. Over the last decade, our products (like Magic Bullet and Trapcode) have become the standard in film and broadcast post-production. With over 200,000 users, it’s nearly impossible to watch 20 minutes of TV without seeing our software in use. From our experiences as artists and filmmakers, we aspire to not only to provide tools for artists, but inspiration as well. Watch our films, learn from over 200 free tutorials, or try our software at redgiant.com.